Starting law school this fall? What to know, do, and buy this summer! Congratulations to all Illini who are completing the law school application cycle! It feels like it’s over, but actually, a whole new stage is just beginning. What should you do now and throughout the summer to make sure you are ready to enter the legal profession? Seat deposits. Now is the time for making those seat deposits to save your seat. While some people will submit multiple seat deposits, if you’ve done your research and completed your visits, you need to only place one seat deposit at your selected school. Remember that starting May 15, every law school can see each deposit that applicants have made–meaning that they will know if you’ve put down multiple deposits. Follow up on wait lists. It is very common to be on one or more wait lists. Revisit this blog post for tips on what to do. Withdraw your other applications. By this point, applicants have narrowed down their law school to one or two top choices. Contact the schools you know you won’t be attending to formally withdraw. This allows those law schools to offer your seat/scholarship to someone else. Some law schools will have a webform to do this, whereas at others, a simple email like this will do. Dear Dean of Admissions, Thank you very much for the opportunity to attend Your Law School. However, after careful consideration I have decided to attend X Law School (or, I’ve decided to attend law school in the midwest/east coast/elsewhere), so I will not be placing a deposit. I very much appreciate your time and consideration of my application. Best wishes, Applicant. Send a final transcript. After graduation, you must provide a final transcript to the law school you are attending. Professional details–You are taking an important step toward beginning your professional life. Start off on the right foot. Clean up your social media presence like your Facebook and Twitter sites. Would you want an employer or law school representative to see every picture or post of yours? If not, take them down, and set privacy restrictions. Set up a new, professional-sounding gmail account (not cubbies14 or hotty100). Learn how to use google calendar–if you haven’t been much of a planner until now, this is a good time to start getting in the habit of planning your days/weeks. Here’s a good video to learn some starter tips and tricks. Create a Linked In profile or update your profile. Subscribe to online news and legal resources such as the New York Times and the National Law Journal to get into the practice of keeping up to date on legal issues. Send a thank you note to your law school recommenders and let them know where you’ve decided to attend law school. Provide your gmail or other non-Illinois email so that they can stay in touch with you after you graduate. Ask if you can connect with them on LinkedIn. Extra credit for delivering an inexpensive token gift such as a coffee gift card or chocolates. You don’t have to spend a lot of money–and shouldn’t–to express your appreciation. Network. Ask lawyers you or your parents know if you can take them to coffee and learn about their practice area. You can use the Illinois Lawyer Finder here to locate lawyers near you by practice area. Use your networking skills and begin reaching out to any contacts in legal fields that interest you. Remember, everyone needs a lawyer eventually, and most people know or have hired a lawyer. Plus lawyers know lots of other lawyers and can introduce or recommend you. You can already start thinking about what kind of 1L summer job you’d like and build the network for that. Create a Google Doc to help with your bar exam application. List every address you’ve ever had, every landlord you’ve ever had, and every speeding and parking ticket you’ve ever received. Get all the records you can for these and for any academic or disciplinary action against you during your undergraduate years. You’ll be applying during your 2L or 3L year to sit for the bar in your chosen state and you will not remember these old details! If you’d like to know what details you’ll be obligated to report on your Illinois Character & Fitness application, visit the Illinois Board of Admission to the Bar application here–be sure to click on the drop down menu to see all the questions in Sections A through J. Click here to explore other states’ bar application requirements. Follow up with the financial aid office of your law school to make sure they have all the documents they need, such as your FAFSA, and that you haven’t missed any opportunities to apply for school-specific scholarships. Apply for scholarships this summer! We posted a Scholarships Spreadsheet over on Compass listing over 200 scholarships for incoming law students (and many which are available to undergrads also). Most federal loans will not be disbursed until AFTER classes begin, so you will need to pay security deposits and the first month of rent as well as buy books and necessary items (below) all before getting your loans. Save up this summer! You will need a suit and dress shoes the very first week of class. You should also bring at least 2-3 business casual outfits that you can wear to networking events. You may need a new or upgraded laptop–check with your law school to see what technology they recommend and what is compatible with their IT systems. Your law school may also offer discounts. A printer is very helpful but you could speak to your roommate(s) to see if they have one before purchasing. Make a budget. Each law school is required to provide a budget in your financial aid package, or you can find it online. You are not required to take the full loan amount; remember that your loans start accruing interest from Day 1 so any amount you do not borrow will save you the interest too. Sit down and carefully consider your living expenses so you can budget accordingly. Remember that your loan disbursement is only designed to pay for tuition/fees and 9 months of living expenses, and it is not designed to cover costs like car payment/insurance, credit card debt, or travel (for example, if you need to fly to your new law school or ship your belongings there). Make living arrangements. Whether you are living in an apartment, with parents, or staying in on-campus housing, you should be figuring out where you will live as soon as possible. Additionally, you should be trying to locate a roommate if you plan on renting an apartment with someone else. Join social media groups for your law school class or speak directly with your school to see if they have a roommate matching system. Take care of anything and everything in your personal life that you can. Get your car serviced, change your cell phone plan, go to the dentist, book necessary travel arrangements, open a bank account in your new city…do anything that you can take care of now. You will not want to spend precious free time on these things later. Go to the doctor and update your vaccinations–law schools will require it. Start or maintain good exercise and eating habits–it’s easier to maintain these than to start them during the semester! Embrace starting over. You have been given a clean slate, so use it wisely. Don’t start law school by being the person who brags about their big scholarship/LSAT score/undergrad accomplishments. Conversely, don’t be intimidated by people in your class with a higher LSAT score/scholarship–frequently the people who will end up at the top of the law school class are not who you would have predicted. You have made it here, you deserve to be here, now embrace the opportunity to start with a clean slate! Finally, WORK HARD from Day 1! 1L grades and class rank are VERY important and will determine things like: whether you can write for a law journal, whether you can participate in moot court, and whether you can interview with law firms before your 2L year in On Campus Interviews (OCI). Start developing a consistent study schedule and the discipline to stick to it. 1L year is not the time to sit back and coast while you adjust to a new life. Remember that law school classes are curved, so by design, everyone will NOT get an A. It is critical not to fall behind on your coursework during the first semester. Clean up your social media presence like your Facebook and Twitter sites. Would you want an employer or law school representative to see every picture you’ve posted? If not, take them down, and set privacy restrictions for future posts. Set up a new, professional-sounding gmail account (not lawguy14 or hotty100). Learn how to use google calendar–if you haven’t been much of a planner until now, this is a good time to start getting in the habit of planning your days/weeks. Here’s a good video to learn some tips and tricks. Create a Linked In profile. Subscribe to free online news and legal resources such as the New York Times and the National Law Journal to get into the practice of keeping up to date on legal issues. Network. Ask lawyers you or your parents know if you can take them to coffee and learn about their practice area. Use your networking skills and begin reaching out to any contacts in industries that interest you. Remember, everyone needs a lawyer eventually, and most people know or have hired a lawyer. Plus lawyers know lots of other lawyers and can introduce or recommend you. You can already start thinking about what kind of 1L summer job you’d like and build the network for that. You should also bring at least 3 business casual outfits that you can wear to networking events. You may need a new or upgraded laptop–check with your law school to see what technology they recommend and what is compatible with their IT systems. Your law school may also offer discounts. A printer is very helpful but you should speak to your roommate(s) to see if they have one before purchasing. Make a budget. Each law school is required to provide a budget in your financial aid package, or you can find it online. You are not required to take the full loan amount; remember that your loans start accruing interest from Day 1 so any amount you do not borrow will save you the interest too. Sit down and carefully consider your living expenses so you can budget accordingly. Remember that your loan disbursement is only designed to pay for 9 months of living expenses, and it is not designed to cover elements like car payments, credit card debt, or daycare. Embrace starting over. You have been given the gift of a clean slate, so use it wisely. Don’t start law school by being the person who brags about their big scholarship/LSAT score/undergrad accomplishments. Conversely, don’t be intimidated by people in your class with a higher LSAT score/scholarship–frequently the people who will end up at the top of the law school class are not who you would have predicted. You have made it here, you deserve to be here, now embrace the opportunity to start with a clean slate! Welcome back! We hope you had a restful break. Still not sure about whether to go straight to law school from UIUC or work for year or two first? PLAS resumes its programming this Wednesday, March 29, 5pm, 514 IUB, with the “Taking a Gap Year” Workshop! Scroll down for more info on this, other programs, UIUC summer class options, and scholarships with deadlines this week! Are you considering working or taking a gap year before law school? Do you want to know more about going straight through to law school after undergrad? 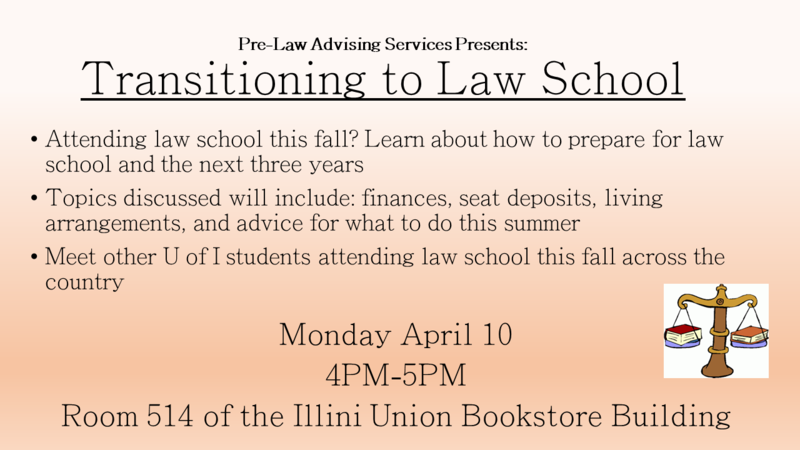 Pre-Law Advising Services and the UIUC Pre-Law Honor Society are co-hosting an event for students to learn more about different paths to law school. The panel will feature three current law students at the UIUC College of Law–two with work experience and one who went directly from undergrad to law school–to answer your questions and discuss the pros and cons of going straight to law school versus taking time off and working. We will also share some tips and suggestions for students to maximize their time and effectively highlight post-undergraduate skills. Are you an international student considering law school in the United States? Join us for this panel. Two second year law students from the University of Illinois College of Law, one originally from China and one originally from the Ukraine, will be answering your questions about attending law school in the United States. Topics discussed will include: the benefits and long-term value of an American law degree, researching your options, visa processes, skills & experiences that are most helpful for employment after law school, and life at an American law school. No registration necessary. PLAS has additional programs planned for April, including: Transitioning to Law School; Applying to Law School; and Personal Statement and Resume for Law School Workshop. Go here for more information on all of our programs: http://illinois.edu/calendar/list/2508. Looking for some ideas for Fall 2017 classes? Watch for for our midweek PLAS blog post! We hope that you have been keeping up on our blog and Facebook posts about internships and summer pre-law programs. Time is slipping away – summer will be here before you know it so if you don’t have anything set, now is the time to work on securing something! Scroll down for info on the Career Center’s “Illini Career & Internship Fair”, set for next Wednesday, April 5 at the ARC! Another resource you should continue to utilize is our 20 page Internship Newsletter over on our Pre-Law Compass page that we posted in December! (Click here for instructions on how to access our Compass page.) The Internship Newsletter has lots of job and internship listings for spring, summer and long-term opportunities from Champaign to D.C. and beyond. In addition, you should regularly check iLink to see if summer internships have been posted there. The Illini Spring Career & Internship Fair connects you with top-notch talent at just the right time! Whether you are seeking to fill a newly opened position, have decided to hire a summer intern or have not reached your hiring target, consider participating in this “just-In-time” career fair. This fair brings together students from a variety of majors who have rich diversity, exceptional skills, and a breadth of experiences. Resume, Cover Letter and Linked In Reviews — March 27, 2-4:30 pm Career Center; 7-9 pm Undergrad Library, Consultation Corner. There are multiple other dates and times for this workshop. Go here to see more options. BARBRI Law Preview and the American Bar Association have partnered to award one incoming law student a $10,000 scholarship and a second runner up a $5,000 scholarship to help offset the cost of first year law school tuition. Application deadline: April 15! Panelists will select and notify 10 finalists by April 25, 2017. Official rules. Complete your online scholarship application on lawpreview.com. How you hope to use your law degree to change our world and how would $10,000 towards your 1L tuition change your world? Stay tuned on April 25, 2017, to see if you’re a winner. The Davis-Putter Scholarship Fund awards scholarships up to $10,000 for students working for social and economic justice. Applications–including recommendations–due THIS Friday, April 1. Click here to apply. The Hispanic Scholarship Fund awards range from $500 to $5,000. Applications due THIS Wednesday, March 30. Click here to apply. The Iranian American Bar Association provides scholarships to law students of Iranian-American heritage. Applications due THIS Thursday, March 31. Click here to apply. Jewish Vocational Service scholarships are available to Jewish students demonstrating financial need. Applications due THIS Thursday, March 31. Click here to apply. Admitted student days are typically day-long events and programs that are held by most law schools for admitted students only. These events allow you to visit and see the school. If you are unsure about your decision, an admitted student day can help make your decision a little easier. When choosing a law school, it is important to make sure it’s the right fit for you. Admitted student days are the best way to learn about the school(s) you are considering. These events are a preview to what the next three years will be like. Travel expenses are also reimbursed for many schools if you are traveling a certain distance for the event. Some schools will cover up to $300-$400 in travel expenses. Check with the school for more information. Business casual dress is a good idea for an event like this. If you meet professors, deans, and other important people, you want to look the part. At the very least, be cognizant that you will be making many first impressions this day, you want to dress appropriately. Check with the school and see if they have a dress code for the day – some schools will be more formal than others. Try to write down your thoughts after the admitted students day. Did you like the way the school was set up? Is there anything unique about the school that made you more inclined to go there? Is there anything you didn’t like? What was your overall impression of the students? If you go to more than one admitted student day, try to remember how the students interacted with one another – could you see yourself fitting in at this school? Talk to the current students about employment, externships/internships, job placements, bar passage rates, and what they think of the school. Current student perspectives can be an asset for the decision process. What type of extracurricular activities are they involved in? Or what clubs? What programs are best for a first year law student to join? How often are there networking events at the law school? If you are concerned about finances, ask students if they work at law firms or are paid research assistants? Are there any ways to off-set the costs early on? What is the average cost for rent? Where do most law students live? What is the month that most leases start? How close are grocery stores and malls? Are there other libraries nearby besides the library in the law building? Do you need a car for this school? What does it cost to park near the law school or to take public transportation? What is it like to travel to this town or city? Some schools are more difficult to get to than others. Keep in mind the trip you will need to take to back for school vacations and breaks. Are there nearby courthouses and law firms where students can work? Refrain from bringing guests to an admitted student day. While it is great to have your parents supporting you, you should be attending this event on your own and the decision you make should be for you. If you cannot make a formal admitted student day or you get off a wait list after an admitted student day, try to visit the law schools you are seriously considering. Law school is busy enough – the first time you step on campus should not be the first day of school. If you are waitlisted at a school and are highly considering it as an option if you get in, try to visit during spring break or when you have the time now. Consider joining “Admitted Student” Facebook pages (if the school has one) and/or other social media accounts if you are looking for a roommate, or trying to meet more people before you start school. Some schools have roommate matching programs in place for the incoming classes. If you know any alumni or current students at the law school you are visiting, check in with them to see the advice they have in mind. If you cannot make the formal event, try to visit over spring break or over a weekend before the next seat deposit is due. Law school is a big investment for both time and money – you want to make sure it’s the right fit for you! 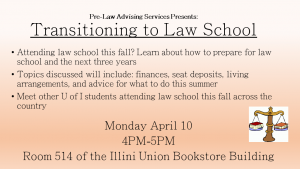 Also, consider attending Pre-Law Advising Services’ “Transitioning to Law School Event” on April 10th to learn more about what you can do to prepare for the start of your law school career! Chicago-Kent: Admitted Students Weekend is: Friday March 31 and Saturday April 1; Other visit days for Admitted Students are: March 10th and 24th, April 7th, 14th, 21st and 28th, and May 5th 11:00 a.m. – 1:00 p.m.
Loyola Chicago: Saturday March 25 and Friday April 28. The Path to Practicing Law in the US: An International Law Student Panel & Discussion: THIS Wednesday, April 8, 2015, 4:30 – 5:30 PM in IUB Room 514. Are you an international student considering attending law school in the U.S.? Join us as we host a panel of international law students from China and Brazil. PLAS welcomes four current College of Law international students, Ning Ning, Andre Reis, Zhiqi Wu and Xi Zhou, to answer questions and discuss their experiences studying law in the U.S. After the panel, students will get to talk to the speakers in small groups. Bring your questions! For more information on the event and the panelists, go here. Food will be served. No registration necessary. Applying to Law School: A Webinar for Fall Applicants: Next Monday, April 13, 4:00-5:15pm. If you are planning to apply to law school this fall, this workshop is for you! We will create a plan to help you maximize your law school applications for admission and scholarship purposes by getting them in EARLY. Topics include: First steps to take in the application process; Making the most of summer; Tackling the personal statement; Creating an application strategy; and Financing your law school application cycle. Bring your questions about law school applications! We are piloting this workshop as a WEBINAR and we will be using Compass. Please register at this link and we will send login information prior to the workshop. For more info about these and other PLAS Events, including our upcoming “Perfecting the Personal Statement and Resume for Law School” workshop, set for Monday, April 20, 4-5pm, IUB 514, go here. Career Center Workshops and Career Fairs —Unless otherwise indicated, all workshops are held at the Career Center, 715 S. Wright Street. For more information or to register, click here. Hire Big 10 Plus Virtual Career Fair, Tues, April 7 and Wed, April 8, 8:00am – 5:30pm. To see what employers are participating and for more info on this live, online event, go here. Research Park Career Fair, Wed, April 8, 4:30-7:00pm, John Deere Bldg, 2021 South First Street, #101. For more info, go here. Professional Communication for International Students, Thurs, April 9, 4-5:30pm, The Interview Suite, 616 E. Green (enter Kaplan building next to McDonald’s and head to 2nd floor). Scroll down for info about this week’s visit from Nicole Vilches, IIT Chicago-Kent College of Law Assistant Dean for Admissions, an update about the June LSAT, the Chicagoland Law Fair on March 26, Illinois in Washington and more! Whether students are meeting law admissions staff at a fair, visiting during an open house, or working with admissions offices to maximize their aid, building relationships with law admissions professionals is critical before, during, and after admission to law school. Nicole Vilches, Assistant Dean for Admissions at IIT Chicago-Kent College of Law, will share the secrets to developing strong relationships with admissions professionals. Pre-law students at every level will gain valuable insight at this workshop. Are you planning on taking the LSAT this June? Registration is open and spots are beginning to fill. LSAC tells us that one Chicago LSAT Test Center, Loyola-Chicago, is already full. Consequently, if you know you are taking the June LSAT but haven’t registered yet, you should do that ASAP. For more information and to register, go here. The Illinois Leadership Center presents Ignite, a workshop to develop skill in leading change and understanding systems thinking, on March 14 from 10:00 am – 5:45 pm. For more information and to register, visit their website here. Unless otherwise indicated, all Career Center events will be held at the Career Center, 715 S. Wright Street. For more information or to register for any of these programs, go here. Creating Powerful Cover Letters and Resumes, March 10, 5-6pm. Finding an Internship, March 12, 6-7 pm. Remember — the All Campus Career Fair is next Wednesday, March 18, 12-4pm, at the ARC! Illinois in Washington – Spend Fall Interning and Taking Classes in Washington, DC! Fall is the best time to come to Washington – lovely weather and less competition for internships. Plus you can apply for internships over summer instead of during the school year! Illinois in Washington is an academic internship program open to all Illinois undergraduates. Students live in Washington, DC, for a semester, intern 4 days a week and take U of I classes. Students intern in a range of positions from nonprofits and government agencies to think tanks and consulting firms. For more information on IIW and our application, see our website and check out our Facebook page. For views from students, visit our blog. If you have any questions, please email Susan Halebsky Dimock, PhD, Interim Director, Illinois in Washington, at sdimock@illinois.edu. We look forward to your applications. Fall 2015 Application Deadline: April 1. This event is sponsored by the Chicagoland law schools. It is designed to help prospective law students assess whether law school is the right choice for them. The program presenters will provide information about the legal market and the application process. The structure is similar to large regional law fairs but the intent is that with a smaller group of law schools, participants in the program will enjoy a more intimate setting. Registration is required on or before Monday, March 16, 2015. For more information and to register, go here. Trials is a unique partnership of NYU School of Law, Harvard Law School, and the Advantage Testing Foundation. It is a fully subsidized/full scholarship summer study program for students of modest means whose backgrounds are currently underrepresented at the nation’s top law schools. Students are not responsible for any tuition, fees, or related expenses. In addition, each Trials student also receives a $3,000 stipend to replace or supplement summer employment income. Each week, senior instructors from Advantage Testing prepare Trials students for the LSAT by deconstructing the test and presenting a step-by-step approach to each question type. Students maintain a rigorous practice testing schedule, frequently sitting for full-length official LSATs under simulated testing conditions. Working closely with their instructors, students learn to develop an individualized study plan, focus their preparation, and apply the core principles they master. Trials students also attend lectures presented by prominent lawyers, public figures, and legal scholars, including distinguished faculty from both NYU Law and Harvard Law School. These lectures provide a wide-ranging introduction to the study and practice of the law while giving students the opportunity to ask specific questions related to their particular fields of interest. Perhaps most important, Trials allows students to experience communities similar to those they will encounter in law school. Students form study groups to challenge, motivate, and inspire one another. In lunches with instructors and speakers, students can take part in informal discussions to learn more about the law, their peers, and themselves. Finally, Trials is committed to taking full advantage of the resources of its host locations. Students enter the field in Boston and New York City to meet with and observe lawyers at work, garnering practical experience that complements the academic curriculum. This year’s program will be held at Harvard Law School June 28- August 2, 2015. Applications are due February 27, 2015. Click here for more information or to apply. The IIT Chicago-Kent Prelaw Undergraduate Scholars program (“PLUS”) offers a unique and unforgettable experience for college students who are interested in the legal profession. This rigorous three-week program is designed to provide students with a “taste” of the law school experience. The program is primarily directed at undergraduate college students from disadvantaged groups that are underrepresented in the legal profession. The PLUS program is a three-week summer institute which will: (1) introduce participants to law school and the legal profession; (2) provide participants with substantive skills to strengthen their preparation for law school; and (3) educate and prepare participants for the law school application and admission process. Students must attend all classes and participate in all program activities to receive a stipend. Because this is a full-time commitment, students must agree not to have any outside commitments that would prevent them from giving the program their full attention. Goal: To prepare talented, motivated, yet under-represented students to successfully gain admission to and succeed in law school. Overview: The ASAP program curriculum will focus on aspects of the law school application process that are commonly overlooked or undervalued by students when applying to law school. ASAP is open to college juniors and seniors, as well as post-graduates. Click here to Register online for the ASAP program. The first year of law school is the most important year. Employers hire second year law students primarily based on their first year GPA. If you want to hear them say “You’re Hired,” and you want to be more than a law school survivor, then you need the right attitude to take control of your legal education. Who should attend? All students who intend to begin law school in the fall of 2015. What is required? Applicants must have been admitted to a law school, submit an online application, and pay a $200 registration fee. Click here for more information or to register online for the AIE Seminar. Interested in participating in a summer pre-law program? Here is some information about opportunities that we have heard about and are passing along to you. Applications for most of these are up and due in the next few weeks. In fact, the application for the Chicago Kent PLUS Scholars Program is due next Monday, March 3! Scroll down for more information!! Also — if you are still looking for summer internships, take another look at our Internship Newsletter, which we first posted in December and have re-posted several times. http://publish.illinois.edu/prelawadvising/2013/12/19/summer-programs-and-internships-newsletter/. The John Marshall Law School will be offering two summer pipeline programs for prelaw students. Both programs will run from Monday, July 28, 2014 through Friday, August 1, 2014 on The John Marshall Law School campus. Legal Education Access Program (LEAP) is a program for college juniors, seniors, and recent graduates interested in pursuing a legal career. This program will support diversity in the legal profession by inspiring students from groups historically under-represented in the law to become lawyers. Illinois Institute of Technology, IIT Chicago-Kent College of Law is sponsoring a Prelaw Undergraduate Scholars (PLUS) Program from June 1 through June 20, 2014. The “RECEIVED” by deadline to submit the application is this Monday, March 3, 2014. The PLUS program is a unique and rigorous three-week experience for current college freshmen, sophomores or juniors interested in the legal profession. The goal is to provide students with a “taste” of the law school experience and introduce them to the admissions process. Students will attend classes taught by IIT Chicago-Kent law professors, recognized as some of the most productive and accomplished law professors in the nation. The program is designed to attract disadvantaged students and those from underrepresented racial and ethnic groups. The program will cover the cost of tuition, room in a residence hall, required course materials and other expenses. Participants are paid a stipend to offset some of their meal and other expenses. The program does not pay for any transportation expenses. For more information and to download the application, go here: www.kentlaw.iit.edu/adm/plus. If you have questions, please contact Theda Mickey at 312-906-5133 or plus@kentlaw.iit.edu. The Florida State University Law School is currently accepting applications for its 2014 Summer for Undergraduates program, which provides students with an inside look at law school and the legal profession. All undergraduate students, except graduating seniors, are eligible to apply. Applicants will be notified of admission decisions around mid-April. Approximately 60 students will be selected to participate in this four-week program. Daily lectures by an Florida State Law professor will familiarize students with the functions of the American legal system. In addition, participants will also be exposed to LSAT overview workshops and a simulated exam, law school admissions sessions, visits to local state and federal courts and law offices, and guest lectures by prominent attorneys in a variety of practice areas. The FSU College of Law provides free room and board, course materials and a travel stipend to all participants. There is no program tuition but participants are responsible for their travel expenses to and from Tallahassee. To apply, students must complete the online application and submit a resume, one letter of recommendation, a personal statement and a current transcript. Applications must be submitted by Friday, March 28, 2014. For more information or to apply, visit www.law.fsu.edu/slp. Preparing talented, motivated, yet under-represented students to successfully gain admission to and succeed in law school. Sponsored by the Council on Legal Education Opportunity (CLEO), the ASAP program curriculum will focus on aspects of the law school application process that are commonly overlooked or undervalued by students when applying to law school. For more information about ASAP go here! Interested in applying? Apply online NOW! CLEO is a non-profit project of the American Bar Association. Since 1968, CLEO has helped more than 7,000 low-income and minority students become successful members of the legal profession. The College Scholars Program seeks to continue this standard of excellence through a collaborative effort between CLEO and colleges and universities throughout the United States. Some universities also offer summer pre-law programs that include a wide range of tuition and other fees. Make sure you carefully research all of the costs associated with these programs before you commit to anything. The University of Kansas offers its six-credit Legal History Program in Cambridge, England, July 5-August 1. Students will, among other things, take courses that explore the deep connections between the cultural and legal history of England and America, and study and compare the origins, purposes and current controversies of contemporary legal regimes in the United States and Great Britain. The application deadline is THIS FRIDAY, March 1. Questions? Contact Professor Kim Warren, Program Director and Associate Professor of History, kwarren@ku.edu. Go here for more information about the program, the cost and to apply: https://ku.studioabroad.com/index.cfm?FuseAction=Programs.ViewProgram&Program_ID=10069. Cornell University hosts its Summer Pre-Law Program in New York City, June 2-July 11. The program features a four-credit course, “Introduction to the American Legal System,” taught using the Socratic method used at most U.S. law schools and offers a limited number of selective internship placements. Admission to the program is on a rolling basis. Because enrollment is limited, you’re encouraged to apply as soon as possible. Applications will be accepted until the program is full. For more information about Cornell’s program, the cost to participate and to apply, go to: http://www.sce.cornell.edu/ss/programs.php?v=PRELAW&s=Overview.